Rajasthan Police Constable Admit Card 2018: Download Rajasthan Police Bharti Hall Ticket/ Call Letter Will be released in 1st week of july. 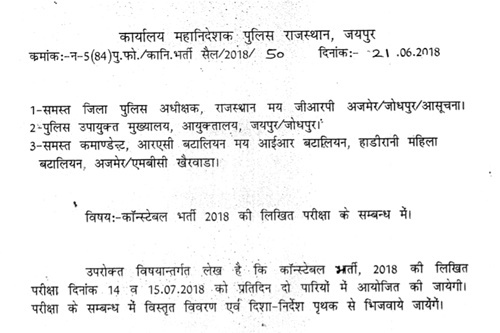 Rajasthan Police Constable Exam Scheduled to conduct on 14th & 15th July 2018. A large number of hopefuls have applied for the Rajasthan Constable posts. The competitors need to clash for the written test as per the scheduled dates. Candidates have to primarily download the admit cards to proceed with the examination. The admit card/ hall ticket is the mandatory document to appear for the written test. The examiners will not allow the candidates to the examination without showing the admit cards. Hence the aspirants must be prepared by downloading the admit cards beforehand. The Rajasthan Police Bharti will release the Police constable hall ticket on its official portal, police.rajasthan.gov.in. Applicants can stay visiting the official portal to download the admit cards. 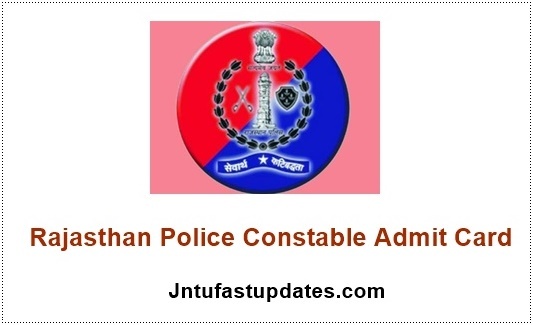 Rajasthan Police Constable Hall Ticket/ Call Letter : Rajasthan Police Constable Bharti has released the notification for 13142 Constable posts. The Constable advertisement was released for Constable (General Duty), Constable (Driver) posts. The organization has released the official notification on 25th May and the application process was also started on the same date. Interested and eligible aspirants waiting for Police Constable notification have applied till the last date, 14th June. The Rajasthan Police department has received a massive number of applications from the interested hopefuls. Candidates in large numbers have applied during the announced dates. The Rajasthan Police Constable Bharti is going to conduct the examination on 14th & 15th july. All the hopefuls have to get ready by downloading the hall ticket. The selection of aspirants will be made by various tests such as written test, physical eligibility test, physical measurements test, and interview rounds. Initially, the competitors need to attend the written test round to shortlist for the preceding rounds. Candidates can get ready by downloading the hall ticket to appear for the written test round. More information about the Rajasthan Police Constable written test and admit card was given below for the reference of aspirants. Name of the Recruitment Organization Rajasthan Police Recruitment Board. Number of Vacancies 13142 Posts. Rajasthan Police Constable Bharti is going to release the Rajasthan Police Driver admit card before 10 days of the examination (approximately). Aspirants can keep visiting the CSBC official website to download Rajasthan Police constable /Driver admit card. The organization will announce the admit card/hall ticket/ call letter release date before it releases the hall ticket. Candidates can check the details of their examination center, date and time of examination from it. Candidates have to report at the exanimation center before 30 minutes of the examination. Also, carry any of the valid identity proof copy along with the hall ticket while going to the examination. After the verification of the identity of the candidate, he/she will be allowed to attempt the examination. Applicants can also check their details such as name, date of birth, hall ticket number, signature, photograph and other details from it.